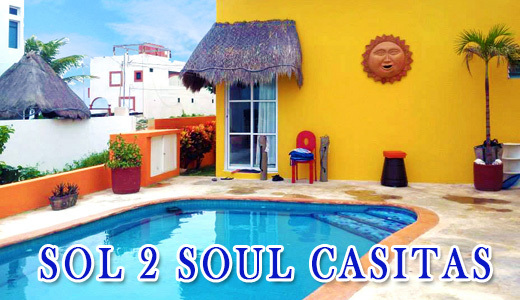 Welcome to the newly owned and updated Sol 2 Soul Casitas (formerly Casa Zorro). 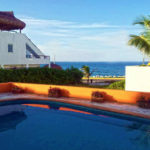 Our property offers 2 private rental casitas perfect for those in need of a relaxing getaway and spectacular views. The casitas are located in La Gloria, also known as “the heavens”. Imagine enjoying your morning coffee or evening cocktail while watching the sunset rise or set over the majestic Caribbean. For an even greater effect the roof top patio offers almost a full 360 degree view of the island and surrounding Caribbean. 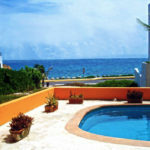 The mid-island location allows easy access for guests to experience the friendly culture and activities of the island. 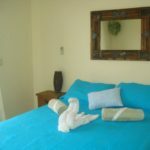 Take a leisurely stroll to the beach, convenience stores, restaurants or full service grocery store. Taxis are inexpensive and can take guests to the well-known North Beach, downtown and the South Point. Golf carts and scooters are also available for rent on the island. The self-contained casitas are designed to provide guests with comfort at an affordable price. 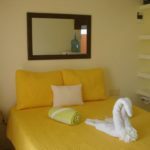 Each air-conditioned unit has a private bathroom, in-room safe, queen size bed and internet access. 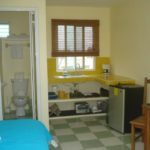 Each Casita has a small fridge with freezer, microwave, toaster oven, coffee maker, blender, hot plate, dishes/utensils, ipod docking stations, hair dryers and table and chairs. The lower casita is poolside with a shaded porch. 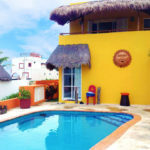 The upper casita has a balcony overlooking the pool. 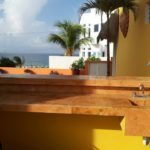 Both units have views of the ocean and use of an outdoor bar area. The property is fully fenced providing privacy without obstructing the ocean views.